In March 2003, Donald Rumsfeld engaged in a little bit of ama- teur philosophizing about the relationship between the known and the unknowns: "There are known knowns. These are things we know that we know. There are known unknowns. That is to say, there are things that we know we don't know. But there are also unknown unknowns. There are things we don't know we don't know." What he forgot to add was the crucial fourth term: the "unknown knowns", things we don't know that we know— which is precisely the Freudian unconscious, the "knowledge which doesn't know itself." 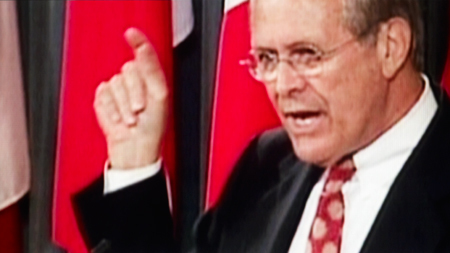 If Rumsfeld thinks that the main dangers in the confrontation with Iraq are the "unknown un- knowns," the threats from Saddam about which we do not even suspect what they may be, the Abu Ghraib scandal shows where the main dangers are: in the "unknown knowns," the disavowed beliefs, suppositions, and obscene practices we pretend not to know about, although they form the background of our public values. The task of philosophy as the "public use of reason" is to unearth these "unknown knowns." It is not to solve problems, but to redefine them; not to answer questions, but to raise the pro- per question. In an old joke from the defunct German Democratic Republic, a German worker gets a job in Siberia; aware of how all mail will be read by censors, he tells his friends: "Let's establish a code: if a letter you will get from me is written in ordinary blue ink, it is true; if it is written in red ink, it is false." After a month, his friends get the first letter written in blue ink: "Everything is wonderful here: stores are full, food is abundant; apartments are large and properly heated, movie theatres show films from the West, there are many beautiful girls ready for an affair-the only thing unavailable is red ink." The structure is here more refined than it may appear: although the worker is unable to signal in the prearranged way that what he reports is a lie, he nonetheless succeeds in getting his message across-how? By inscribing the very reference to the code into the encoded message, as one of its elements. Of course, we encounter here the standard problem of self-reference: since the letter is written in blue, is not its entire content true? The solution is that the very fact that the lack of red ink is mentioned signals that it SHOULD have been written in red ink. The nice point here is that this mention of the lack of the red ink produces the effect of truth independently of its own literal truth: even if red ink really WAS available; the lie that it is unavailable was the only way to get the true message across in this specific condition of censorship. And is this not the matrix of critical philosophy, not only in "totalitarian" conditions of censorship, but perhaps even more, in the more refined conditions of liberal censorship? One starts with agreeing that one has all the freedoms one wants-and then one merely adds that the only thing missing is the "red ink": we "feel free" because we lack the very language to articulate our unfreedom. What this lack of red ink means is that, today, all the main terms we use to designate the present conflict-"war on terror," "democracy and freedom," "human rights," etc. etc.-are FALSE terms, mystifying our perception of the situation instead of allowing us to think it. In this precise sense, our "freedoms" themselves serve to mask and sustain our deeper unfreedom-that is what philosophy should make us see. Excerpts from: Žižek, S., "Philosophy, the "unknown knowns", and the public use of reason", in Topoi, vol. 25, no. 1–2 (2006): 137–42.